From Aardvarks to Zinc: Science: Bell Rocket Belt. 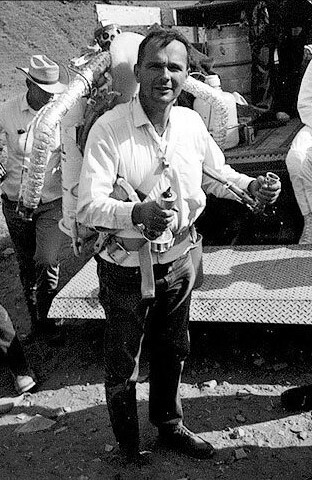 In the early 1960s, Bell Aerosystems built a rocket pack which it called the "Bell Rocket Belt" or "man-rocket" for the US Army, using hydrogen peroxide as fuel. This concept was revived in the 1990s and today these packs can provide powerful, manageable thrust. This rocket belt's propulsion works with superheated water vapor. The rocket could carry a man over 9-meter-high obstacles and reached a speed of 11 to 16 km/h. However, its flying time was limited to 20 seconds. A later advancement during the years 1995-2000 could not improve the flying time to any more than 30 seconds. The pack's pilot wears shielding overalls made of thermal resistant material, since the exhaust jet and the engine's pipes are very hot. The crash helmet (which has inside it the signal buzzer) is put on. The rocket thrust-chamber's supersonic exhaust jet makes a deafeningly loud sound (by force to 130 decibels), more like a shrill screech than the roar of an aeroplane's jet engine. As a rule, the jet exhaust is transparent and not visible in air. But in cold weather the water vapor, which is a large part of the steam-gas mixture, condenses soon after it leaves the nozzle, and then a cloud of water fog enwraps the pilot (for this reason, the very first tethered flights of the Bell Rocket Belt were carried out in a hangar).